2019’s Best Local SEO Strategy! Learn exactly how to outrank your competition and take over the #1 spot on Google FAST! This video shows how to do local seo in 2019. We go beyond local seo tips and give you a step-by-step breakdown explaining how you can dominate the first page of Google with your local business website. 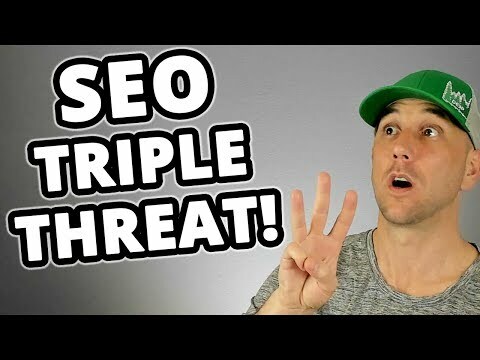 the approach is called the triple threat… The triple threat refers to dominating three specific areas of the first page of Google with your search engine optimization efforts. Each of the 3 parts in the triple threat requires you to leverage a different part of Google’s services in order to dominate. this video goes through a real local business who is ranking for the triple threat in 2019 so you can understand what your goal as a local marketing agency or local business owner is when it comes to the first page of Google for your target keyword. First is the paid advertisement at the very top. This is run through the Google AdWords program and requires you to pay per click from people searching for your target keyword phrase. It is important that you have a business model that is able to scale with the volume of traffic you’re buying and that you have a website that is proven to convert visitors searching for your phrase into customers. If you don’t have proof that your website converts clicks into sales, you should not be buying sales and you should be working on conversion rate optimization on your website. The second part is the Google maps. You will learn exactly how to rank in Google maps fast. There are three specific areas of focus in order to rank on Google’s map pack or snack pack as it’s called sometimes in SEO circles. Google maps SEO is really “Google My Business SEO” and you need to first claim your website in the google.com/business platform. This is called the Google my business, often referred to as GMB by professionals and is 100% free for local business owners. You claim your listing, and enter your name, address and phone number then verify your address with their postcard. You learn step-by-step in this video! Beyond the Google my business optimization, there are two other parts of Google maps SEO that you need to focus on. Number one the name address and phone number citations from third-party websites (often called NAP citations). Number two- your reputation management or the star rating… Both the number of star ratings and the quality of your star ratings. I reveal several tips and a specific strategy on how to increase the number of positive reviews while decreasing the number of negative reviews your business will receive. Finally is the standard website ranking in the organic area on Google. This lies below the Google maps and you want to be the number one spot which means you are above every single person ranking for that specific page. Number one is keyword research. Number two is on page SEO. Number three is high quality and authoritative backlinks. If you execute on these local SEO tips in 2019 you will outrank your competition and you have a chance to take over the triple threat position which means you will get the lion’s share of clicks and customers from Google for your business. MOZ vs SEMRush 2019 – Side by Side Comparison: Which SEO Tool is Better?